The history of York Buildings is closely tied-in with the palaces of King James I and Charles I, and it was originally the site of the Prince's Lodging House - further details about this can be found on the page for the palace. York buildings was built in 1832 (there's a plaque on the front wall stating this). As can be seen in the history list above over the years the internal make-up of the building has changed. The assumption in the numbering scheme shown above is that No.89 is the rear entrance and what was the house above the shop(s). The ordnance survey map of 1886 clearly shows that the building was subdivided into three sections and the numbering scheme above assumes that as you move along the High Street from left to right that No.91 is adjacent to Kingston Passage, No.93 is the central section and No.95 is that closest to the Jockey Club. If anyone can confirm or further explain this numbering scheme please E-MAIL me. William Vince was the son of William and Pheobe Vince, born in Little Thurlow in 1821 and baptised there on 29th April 1821. His wife was Annie Marie Ward. 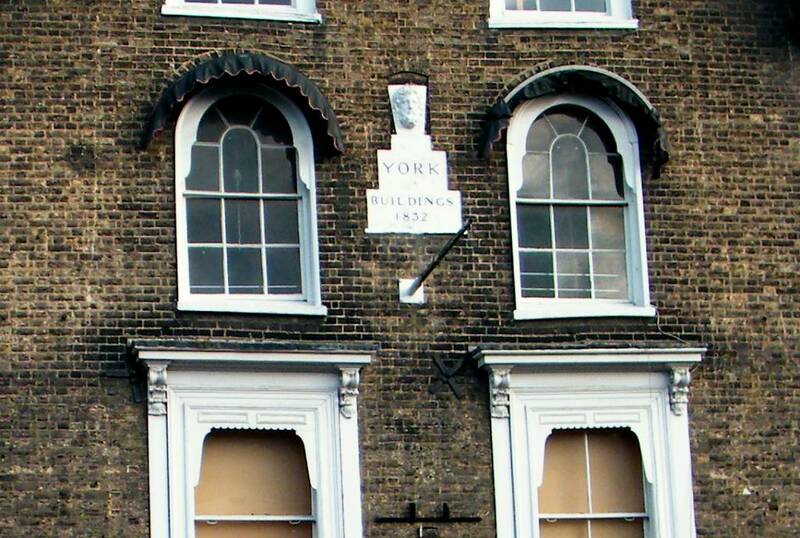 The first record of him as a draper in York Buildings is in 1851, in both Gardner's Directory and on the census. As the history above shows he wasn't the only occupant in York Buildings, but he did outstay most of his co-occupiers. His time as a draper could have come to an early end; as on 17th March 1868 he was declared bankrupt, but circumstances must have changed fairly rapidly as the bankruptcy was discharged on 29th June 1868. William was still listed here in the Post Office Directory in 1879, his last record here, by then he'd been joined by a better known draper at this address - Henry Bullman. Henry was born in Mildenhall in 1849 and he married Jane Bates at Luton St. Mary on 4th September 1879. Henry's presence in York Buildings is fairly well known; as he created what was called Henry Bullman's Drapery Emporium. He stayed here until his death in 1914, though in 1901 he was living at the Grove in Falmouth Avenue, but was back here in the High Street by the 1911 census. 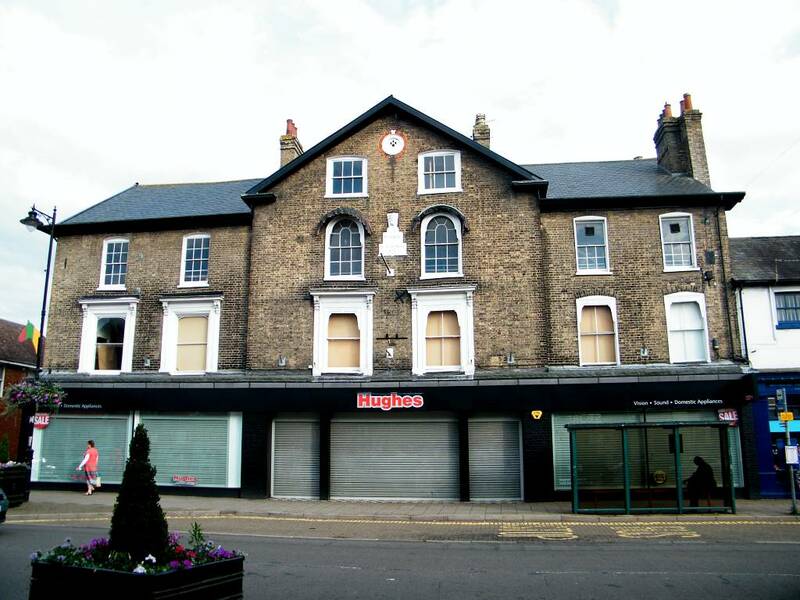 By 1904 he'd been joined by another well known Newmarket business - Harper & Co., piano warehouse. It's known that they occupied the right hand unit - No.95. Harper's eventually moved to their even better known location at No.16 High Street, though it's not when this happened. Manning Ashford had been a competitor draper to Henry Bullman at No.72 High Street, on the corner of Market Street. 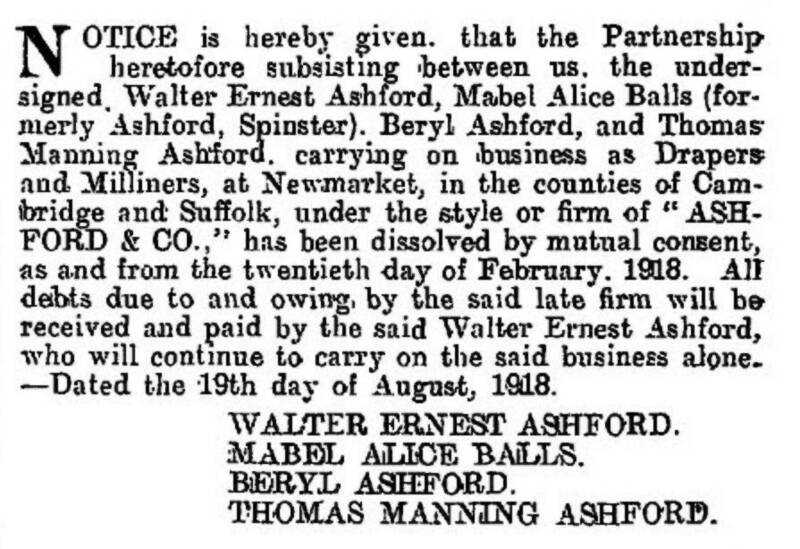 Following his death on 4th January 1911 the business was taken over by his son Walter Ernest Ashford. Walter married Dulcie Balls in Mutford in 1914. By Kelly's Directory of 1916 Walter had started his own drapery shop in York Buildings, alongside butcher Frederick Winton-Smith and Harper's Music Saloon. This trio of shops stayed here until at least after 1936, until eventually Ashfords took over the whole of York Buildings and their name became synonymous with the building. It can be seen by the public announcement below that following Manning's death originally his drapery business had continued as a family partnership, but on 20th February 1918 this was dissolved and Walter took over as sole owner. Walter died in Dec 1971 in Newmarket. Walter's son David Manning Ashford (born 22nd December 1921), continued the business until his death in March 1991. 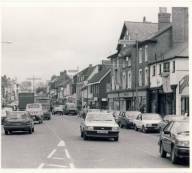 Photo Ashfords c.1985 by kind permission of the Newmarket Journal and the Newmarket Memories Facebook page.